A rod which, in the hands of Aaron, the high priest, was endowed with miraculous power during the several plagues that preceded the Exodus. In this function the rod of Moses was equally potent. Upon two occasions, however, the singular virtue of spontaneous power, when not in the grasp of its possessor, was exhibited by Aaron's Rod. At one time it swallowed the rods of the Egyptian magicians, and at another it blossomed and bore fruit in the Tabernacle, as an evidence of the exclusive right to the priesthood of the tribe of Levi (see Aaron). In commemoration of this decision it was commanded that the rod be put again "before the testimony" (Num. xvii. 10). A later tradition asserts (Heb. ix. 4) that the rod was kept in the Ark of the Covenant. The main fact, however, is thus confirmed, that a rod was preserved in the Tabernacle as a relic of the institution of the Aaronic priesthood. "the staff with which Jacob crossed the Jordan is identical with that which Judah gave to his daughter-in-law, Tamar (Gen. xxxii. 10, xxxviii. 18). It is likewise the holy rod with which Moses worked (Ex. iv. 20, 21), with which Aaron performed wonders before Pharaoh (Ex. vii. 10), and with which, finally, David slew the giant Goliath (I Sam. xvii. 40). David left it to his descendants, and the Davidic kings used it as a scepter until the destruction of the Temple, when it miraculously disappeared ( ). When the Messiah comes it will be given to him for a scepter in token of his authority over the heathen." That so wonderful a rod should bear external signs of its importance is easily to be understood. It was made of sapphire, weighed forty seahs (a seah = 10.70 pounds), and bore the inscription , which is composed of the initials of the Hebrew names of the Ten Plagues (Tan., Waëra 8, ed. Buber). Legend has still more to say concerning this rod. God created it in the twilight of the sixth day of Creation (Ab. v. 9, and Mek., Beshallaḥ, ed. Weiss, iv. 60), and delivered it to Adam when the latter was driven from paradise. After it had passed through the hands of Shem, Enoch, Abraham, Isaac, and Jacob successively, it came into the possession of Joseph. On Joseph's death the Egyptian nobles stole some of his belongings, and, among them, Jethro appropriated the staff. Jethro planted the staff in his garden, when its marvelous virtue was revealed by the fact that nobody could withdraw it from the ground; even to touch it was fraught with danger to life. This was because the Ineffable Name of God was engraved upon it. When Moses entered Jethro's household he read the Name, and by means of it was able to draw up the rod, for which service Zipporah, Jethro's daughter, was given to him in marriage. Her father had sworn that she should become the wife of the man who should be able to master the miraculous rod and of no other (Pirḳe R. El. 40; Sefer ha-Yashar; Yalḳ. Ex. 168, end). It must, however, be remarked that the Mishnah (Ab. 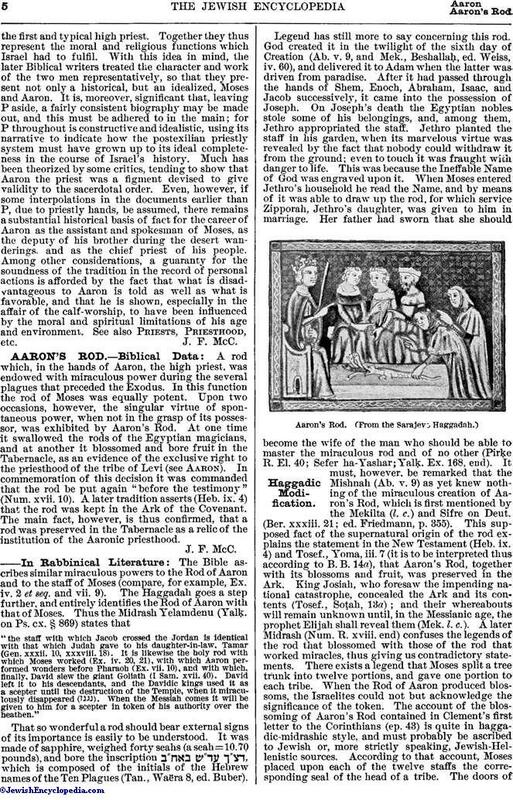 v. 9) as yet knew nothing of the miraculous creation of Aaron's Rod, which is first mentioned by the Mekilta (l.c.) and Sifre on Deut. (Ber. xxxiii. 21; ed. Friedmann, p. 355). This supposed fact of the supernatural origin of the rod explains the statement in the New Testament (Heb. ix. 4) and Tosef., Yoma, iii. 7 (it is to be interpreted thus according to B. B. 14a), that Aaron's Rod, together with its blossoms and fruit, was preserved in the Ark. King Josiah, who foresaw the impending national catastrophe, concealed the Ark and its contents (Tosef., Soṭah, 13a); and their whereabouts will remain unknown until, in the Messianic age, the prophet Elijah shall reveal them (Mek. l.c.). A later Midrash (Num. R. xviii. end) confuses the legends of the rod that blossomed with those of the rod that worked miracles, thus giving us contradictory statements. There exists a legend that Moses split a tree trunk into twelve portions, and gave one portion to each tribe. When the Rod of Aaron produced blossoms, the Israelites could not but acknowledge the significance of the token. The account of the blossoming of Aaron's Rod contained in Clement's first letter to the Corinthians (ep. 43) is quite in haggadic-midrashic style, and must probably be ascribed to Jewish or, more strictly speaking, Jewish-Hellenistic sources. According to that account, Moses placed upon each of the twelve staffs the corresponding seal of the head of a tribe. The doors ofthe sanctuary were similarly sealed, to prevent any one from having access to the rods at night. This legend of the rod as given by the Syrian Solomon in his "Book of the Bee" ("Anecdota Oxoniensia, Semitic Series," vol. i. part ii.) has Christian characteristics. According to it the staff is a fragment of the Tree of Knowledge, and was successively in the possession of Shem, of the three Patriarchs, and of Judah, just as in the Jewish legend. 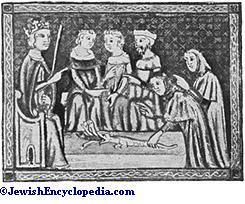 From Judah it descended to Pharez, ancestor of David and of the Messiah. After Pharez's death an angel carried it to the mountains of Moab and buried it there, where the pious Jethro found it. When Moses, at Jethro's request, went in search of it, the rod was brought to him by an angel. 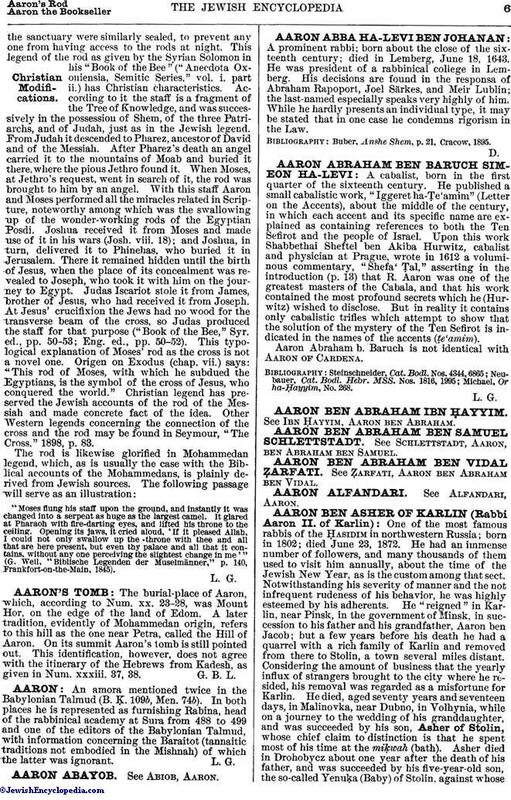 With this staff Aaron and Moses performed all the miracles related in Scripture, noteworthy among which was the swallowing up of the wonder-working rods of the Egyptian Posdi. Joshua received it from Moses and made use of it in his wars (Josh. viii. 18); and Joshua, in turn, delivered it to Phinehas, who buried it in Jerusalem. There it remained hidden until the birth of Jesus, when the place of its concealment was revealed to Joseph, who took it with him on the journey to Egypt. Judas Iscariot stole it from James, brother of Jesus, who had received it from Joseph. At Jesus' crucifixion the Jews had no wood for the transverse beam of the cross, so Judas produced the staff for that purpose ("Book of the Bee," Syr. ed., pp. 50-53; Eng. ed., pp. 50-52). This typological explanation of Moses' rod as the cross is not a novel one. Origen on Exodus (chap. vii.) says: "This rod of Moses, with which he subdued the Egyptians, is the symbol of the cross of Jesus, who conquered the world." Christian legend has preserved the Jewish accounts of the rod of the Messiah and made concrete fact of the idea. Other Western legends concerning the connection of the cross and the rod may be found in Seymour, "The Cross," 1898, p. 83. "Moses flung his staff upon the ground, and instantly it was changed into a serpent as huge as the largest camel. It glared at Pharaoh with fire-darting eyes, and lifted his throne to the ceiling. Opening its jaws, it cried aloud, 'If it pleased Allah, I could not only swallow up the throne with thee and all that are here present, but even thy palace and all that it contains, without any one perceiving the slightest change in me'".